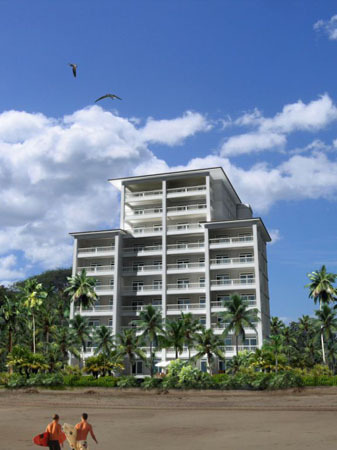 The Palms (34 units) sits at the north end of Jaco Beach, Costa Rica. Facing vast panoramas of the Pacific Ocean, this beachfront condo tower boasts spacious 2-bedroom, 3-bedroom condos within easy reach of the varied attractions of downtown Jaco. Modern architecture and sweeping ocean views promise the perfect setting for your Costa Rica vacation home. The project will eventually feature a phase II development, which will expand common areas and swimming pools.